This article originally appeared in The Telegraph on 5 March 2014. It is reproduced by permission of the author. Five years ago today, the Bank of England cut interest rates about as low as they can go: 0.5 percent. And there they have remained. If rates have been rock bottom for five years, our central bankers have been cutting them for even longer. You need to go back almost nine years to find a time when real interest rates last rose. Almost a million mortgage holders have never known a rate rise. And this is all a Good Thing, according to the orthodoxy in SW1. Sure, low rates might hit savers, who don’t get such good returns, but for home owners and businesses, it’s been a blessing. Don’t just compare the winners with the losers, say the pundits. Think of the whole economy. Rates were set at rock bottom shortly after banks started to go bust. Slashing the official cost of borrowing saved the day, they say. I disagree. 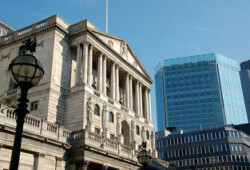 Low interest rates did not save the UK economy from the financial crisis. Low interest rates helped caused the crisis – and keeping rates low means many of the chronic imbalances remain. To see why, cast your mind back to 1997 and Gordon Brown’s decision to allow the Bank of England to set interest rates independent of any ministerial oversight. Why did Chancellor Brown make that move? Fear that populist politicians did not have enough discipline. Desperate to curry favour with the electorate, ministers might show themselves to be mere mortals, slashing rates as an electoral bribe. The oppostite turned out to be the case. Since independence, those supermen at the central bank set rates far lower than any minister previously dared. And the results of leaving these decisions to supposedly benign technocrats at the central bank has been pretty disastrous. Setting interest rates low is simply a form of price fixing. Set the price of anything – bread, coffee, rental accommodation – artificially low and first you get a glut, as whatever is available gets bought up. Then comes the shortage. With less incentive to produce more of those things, the supply dries up. So, too, with credit. When politicians praise low interest rates, yet lament the lack of credit, they demonstrate an extraordinary, almost pre-modern, economic illiteracy. Too many politicians and central bankers believe cheap credit is a cause of economic success, rather than a consequence of it. We will pay a terrible price for this conceit. Low interest rates might stimulate the economy in the short term, but not in a way that is good for long-term growth. As I show in my paper on monetary policy, cheap credit encourages over-consumption, explaining why we remain more dependent than ever on consumer- (and credit-) induced growth. Cheap credit cannot rebalance the economy. By encouraging over-consumption, it leads to further imbalances. Think of too much cheap credit as cholesterol, clogging up our economic arteries, laying down layer upon layer of so-called “malinvestment”. “Saved” by low rates, an estimated one in 10 British businesses is now a zombie firm, able to service its debts, but with no chance of ever being able to pay them off. Undead, these zombie firms can sell to their existing customer base, keeping out new competition. But what they cannot do is move into new markets or restructure and reorganise. Might this help explain Britain’s relatively poor export and productivity performance? What was supposed to be an emergency measure to get UK plc through the financial storm, has taken on an appearance of permanence. We are addicted to cheap credit. Even a modest 1 per cent rate rise would have serious consequences for many. Sooner or later, interest rates will have to rise. The extent to which low interest rates have merely delayed the moment of reckoning, preventing us from making the necessary readjustments, will then become painfully evident. We are going to need a different monetary policy, perhaps rather sooner than we realise. Previous articleTTIP – when free trade goes wrong? Then, in 2008, instead of allowing the credit bubble banks and so on (i.e. the structure they had encouraged every-step-of-the-way) to collapse – the government controlled Central Banks (such as the Bank of England) went into overdrive – creating money without limit to prop up a total mess. Sadly the structure of the economy (such as the London property market) is not so distorted that there is no good way out of it. This whole financial system is now rotten to the core. There is no longer any real connection between real saving and borrowing (such as government borrowing – or even private borrowing). It is just a mess – a total mess. At least two MPs care and one co-founded the Cobden Centre. And many thanks to you Mr Baker, and to Mr Carswell also. OK so 2 MPs understand the situation elderly savers have been dumped in but exactly what are they doing about it ? Our rights are being walked over and down trodden all because we were careful and went without throughout life . Why interfere with interest rates at all? I.e. why not leave them to find their own level? I.e. what about having the government / BoE feed enough base money into the economy to keep the economy at capacity, and just forget about interest rates? Natural interest rates are the interest rates at which REAL SAVERS will give up some of their income (i.e. SACRIFICE CONSUMPTION) to lend it out to specific borrowers. When the real savers have lent out this money they (the real savers) do not have the money any more till when and IF it is repaid – this loss of the money for a specific period (and the risk that the money will never be repaid at all) gives rise to interest rates via Time Preference (people prefer to have money NOW as opposed to money in the future – to get them to settle for money in the future, i.e. to lend out the money they already have, one must promise them MORE money and convince them that one is good for the loan, i.e. that one will repay it). Anything that disrupts the above (for example by lending out “money” that nobody really saved, or by convincing savers they still have the money AFTER it has been lent out) causes economic chaos. First, even or especially as a Yank, I would like to echo the sentiments of Mr. Marks to Misters Baker and Carswell. Second, one part of Mr. Musgrave’s comment frustrates me. The proper amount of base money to add to an economy would seem to be zero. Adding the “correct” amount is an impossible task. No man, committee or council has ever been, is or will ever be capable of doing that. There is no need to increase the money supply. Any attempt to do so merely provides the creators of the money with opportunities for mischief. If the same number of monetary units buys more goods it is not a bad thing. If the price of your house in monetary units goes down but you can exchange it for more goods and services, it would seem to be a good thing. A stable supply of monetary units with increased production equals more wealth. True, a unit of labor would command fewer monetary units but the unit of labor would still be exchanged for more goods and services if that unit of labor produced the same amount of goods or services. This is a truth so simple a child can understand it. We as a society cannot seem to grasp it only because of generations of obfuscation by “learned men”. Third, Mr. Carswell, I believe you are correct that a lot of businesses will be in trouble if interest rates rise. Should there be as great a concern about the effect rising interest rates might have on governments’ ability to service their debt? Would a government default or liquidation be better or worse than a business default or liquidation? ‘When politicians praise low interest rates, yet lament the lack of credit, they demonstrate an extraordinary, almost pre-modern, economic illiteracy’. Excellent & duly tweeted, but I think it was cheap credit for a little longer than 5 years old son! Helen Jones – sadly a few Members of Parliament can do little. They can speak and they can vote – and they DO. But their power is limited. If they forced their way into Mr O’s office and banged on the table, they would simply removed by security (they would be out of Parliament, off the candidates list – and the media would portray them as “nutters” engaged in a “publicity stunt”). However, if there is a big shock in May (a massive collapse in the Conservative party vote) even Mr Cameron may finally understand that something is wrong. Rich Osness – even Milton Friedman EVENTUALLY come to understand that the “monetary base” should be frozen (NOT “increased in line with increasing output to maintain a stable price level” – the Irving Fisher fallacy, followed by Benjamin Strong and Alan Greenspan). Of course Ralph Musgrove would (quite correctly) come back and say that even if the monetary base was frozen, the antics of fractional reserve bankers would still produce boom-busts. However, these boom-busts would be much smaller than they are now. For example, every time Alan Greenspan “saved the world” (i.e. saved the banking credit bubble) by throwing more “monetary base” at the bankers, he made the credit bubble (and therefore the eventual bust) bigger. I’ve been reading up on some things, with some time on my hands, & come up with some surprising conclusions. Firstly I researched global warming, to fairly quickly find it’s a huge hoax, tied closely to central banksters, & hard left “progressive” desires for One World Govt, & Totalitarian Fascist control. The EU is seen as the first step towards this One World Govt, which is why the unaudited(for 19 years), corrupt, undemocratic & bankrupt nonsense is being propped up via the ECB, by the unaudited, corrupt, privately owned FED in the US. The FED seems to be in the process of reducing the $dollar to toilet paper value through massive QE, (The biggest Wall St. backdoor bailout in history). Since the Fed’s inception, Christmas 1913, the US$’s purchasing power is now down to ~ 3 cents & going south at a rate of knots. Since the Gold Standard was abandoned so Tricky Dicky could fight the Mad Vietnam War, 1971, the Brit £’s now down to ~7p, & heading southward. This situation profits only those who have an inside track on the rigged stock markets & can make returns greater than inflation, or those who have voted themselves inflation proof salaries & pensions. Now I wonder who that might be? For everyone else, pensions & savings are destroyed. To see privately owned Central Banks as Govt controlled is less than accurate from my point of view. Ron Paul spent 20 of his 23 years as a Texas Senator trying to secure an audit of the FED. That & “too big to fail” tells me who’s in control, & it’s not the politicians. Do I have things right so far? Do you have a view on the Bradbury £, last used 1913, when the banks were in trouble? while in the House, & if so, why? Is the Brit £ issued at interest to the Brit Treasury by the privately owned BOE, which if I understand correctly, is the FED system in the US? May I recommend Bill Still’s epic 3.5 hr documentary: “The Money Masters”.